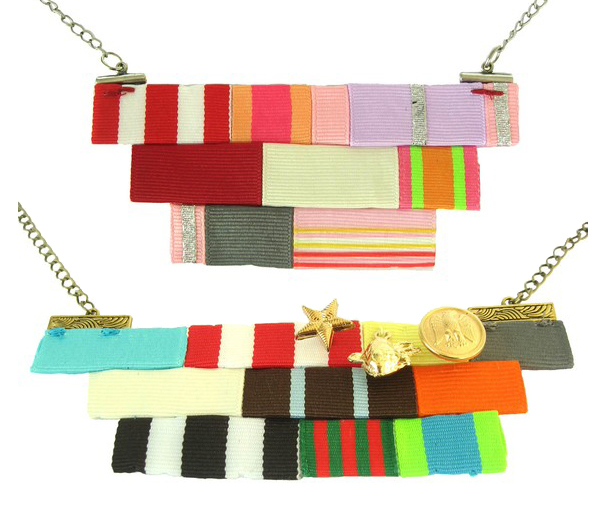 Inspired by these military ribbon inspired necklaces created by Michelle Hartney aren't they pretty darn cool? Each color represents a a different human characteristic with a legend to tell you about it. Wowee zowee! I love them! Those are amazing! I love the concept. It makes me almost want to take my grandfather's ribbons and turn them into a nice keepsake. Very creative take on the military look! Michelle is so cute and so is her jewelry + art! so cool! i love the military vibe, but with fun colors! It's like that girl has tapped my brain and made my dream necklaces. I LOVE them. The colours, the stripes, the odd combinations. Fab! Totally inspired. Love them! Thanks for sharing. Very original and so "in" all the time!